My mother married in 1930, just as the Great Depression descended upon our country like locusts on a cornfield. Her life in the Dust Bowl area included a Hooverville, The Black Hand, midwife delivery of my older brother, and feed sack material for hand sewing. While my father worked six days a week, 12 hours a day digging irrigation ditches for Colorado beet farmers, Mom stitched together small scraps of flour bag muslin in calicos or plain colors. 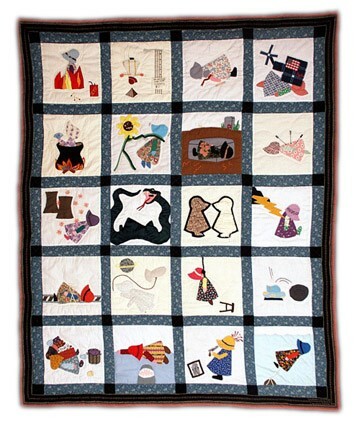 Her quilts still inspire admiration for their workmanship. After my mother’s death, a 12×12 inch block featuring Sunbonnet Sue lay in a closet with precisely folded scraps of fabric. Sewn with an embroidery stitch in black, Sue captured my imagination. Then I discovered the myriad of variations on the design. It fascinated me. Apparently, even my mother had succumbed to the allure of this popular applique pattern. 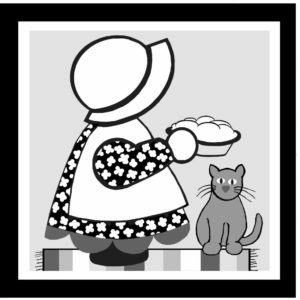 During the Depression years, Sunbonnet Sue and her friend, Overall Sam, appeared on quilts, coloring books, tea towels, greeting cards, dishes and other decorative items. 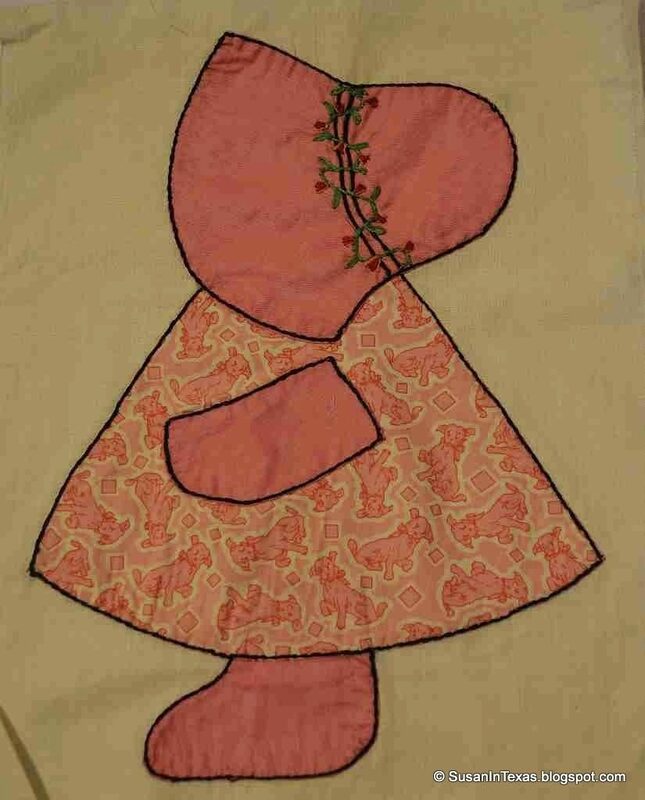 This 1930 pattern used up the pieces of material from sewing in a creative manner, which appealed to the frugal minded homemakers like my mother. The basic design for Sunbonnet Sue can be traced to the late 1800’s when British book editor, Kate Greenaway, introduced little girls in bonnets in the book Under the Window in 1878. But it was in the early 1900’s that Sunbonnet Sue rose to folk image fame. 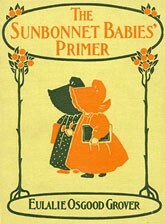 In 1900 Bertha Corbett Melcher published a book, The Sunbonnet Babies, in which illustrator Eulalie Osgood Grover depicted young girls with their faces hidden by bonnets. 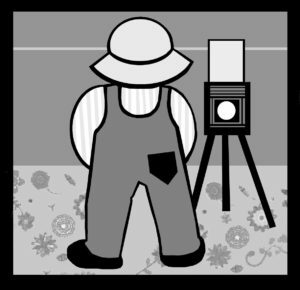 Their books taught children how to read through the antics of Sunbonnet Sue, Fisherman Fred and Overall Sam. Teachers and parents enjoyed reading the books of this sweet, wholesome group of children to their own broods. Sue and the Gang caught on like caramel covering apples. Applique templates from Ladies Art Patterns and McCall’s Pattern Company depicted Sue in profile with an over-sized pinafore dress and large bonnet, like Melcher’s illustrations in her book. 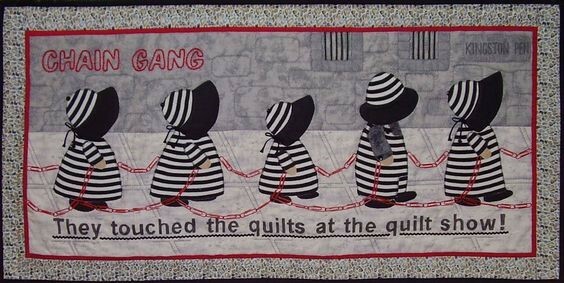 The patterns were passed around in quilting clubs and embellished upon by each stitcher. Everyone interpreted Sunbonnet Sue’s life from a unique vision. She flew kites, played with kittens, hung clothes on a line, carried books to school, and held hands with Overall Sam. During the poverty of the Great Depression, people yearned for reminders of happier days. The simple scenes of Sunbonnet Sue and Overall Sam brought a sense of sentimentality to the sewists enamored by the ever-present bonnet. Perhaps the eventual lack of fascination of these faceless reflections of quilters’ imagination should have been predicted. Too much sweetness and goo. In 1979, quilters in Lawrence, Kansas decided to take needles into their own hands. Calling themselves the “Seamsters Union Local #500”, they created a twenty block quilt. Each block depicted a method of death reflecting the culture of the 1970’s. There are scenes of “Sunbonnet Sioux” shot with arrows, another with Sue being strangled by a sunflower. “Three Mile Island” Sue is surrounded by atoms. Even Jaws III swallowed up Sue. The quilt is now on display with the Michigan Quilt Project Museum. Regardless of the antagonistic feelings of others, I still like Sunbonnet Sue and Overall Sam. When I wrote Dust Between the Stitches, the heroine created a family quilt using the feed sack scraps acquired from different sources in her Colorado Dust Bowl farm. 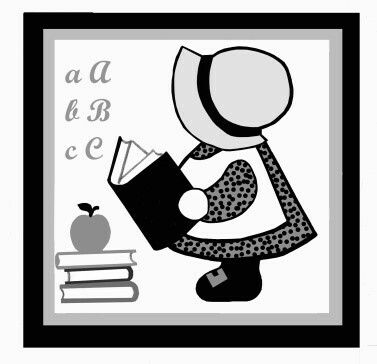 Each chapter of the book is prefaced with a Sunbonnet Sue square that relates to the plot. The novel is a testimony to the stalwartness of those like my mother and father who faced adversity with quiet dignity. 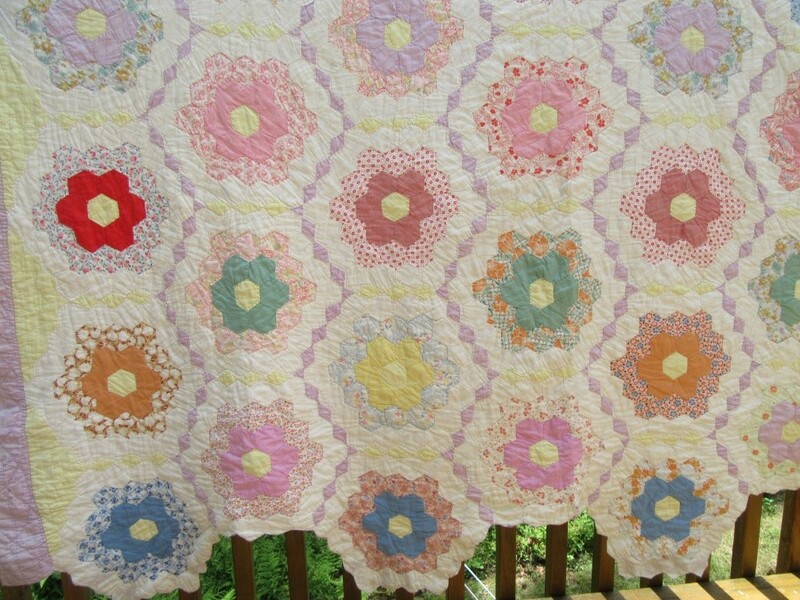 One square of Sunbonnet Sue. A gift from my mother to me. It is part of my family’s legacy of frugality and creativity despite difficult circumstances. 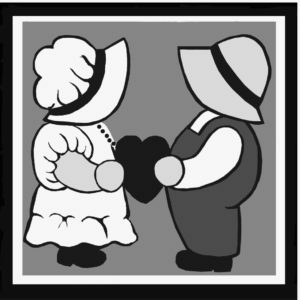 Sunbonnet Sue represents my mother’s strength of character. Most important, that faceless bonnet is a visual representation of a generation of strong women. Good news to quilters. In September, Dust Between the Stitches, will be available as an audiobook. 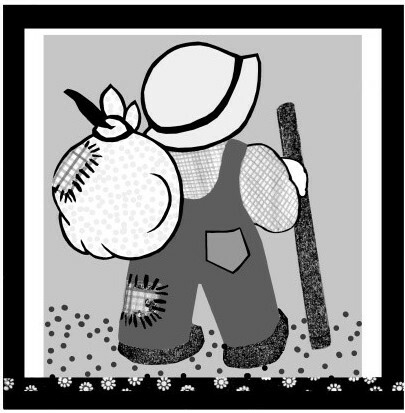 As the needles whirr on your sewing machine, listen to the story of Addy Meyers in the Dust Bowl. 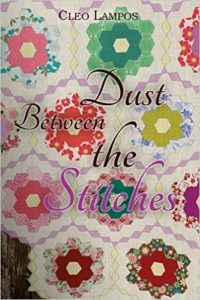 As Addy creates a Sunbonnet Sue quilt in the midst of personal doubts and the certain foreclosure of the farm, she finds that God has not abandoned the people in the hardest hit area of the Great Depression. It is an inspirational story based on solid research that is worth hearing. Bertha Corbett Melcher, Dust Bowl, Great Depression, quilts, Seamsters Union Local #500, Sunbonnet Sue. Bookmark. Not only is your story about family, especially your mother, during the Dust Bowl, special, but I loved you book, Dust Between the Stitches! 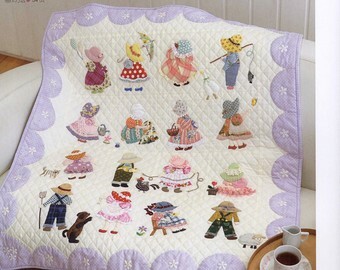 Lovely post I just love the Sunbonnet Sue pattern and recently began working on some Witch Bonnet Sue pieces. Love the darker side of Sue patterns too. Her life in the Dust Bowl area included a Hooverville, The Black Hand, midwife delivery of my older brother, and feed sack material for hand sewing.